Argonaute (AGO) is the core component of RNA-induced silencing complex. The AGO gene family has been analyzed in various plant species; however, there is no report about AGOs in the well-known Traditional Chinese Medicine (TCM) plant, Salvia miltiorrhiza. Through a genome-wide analysis, we identified ten SmAGO genes in S. miltiorrhiza. Full-length cDNAs of all SmAGOs were subsequently cloned and sequenced. These SmAGOs were characterized using a comprehensive approach. Sequence features, gene structures and conserved domains were analyzed by the comparison of SmAGOs and AtAGOs. Phylogenetic relationships among AGO proteins from S. miltiorrhiza, Arabidopsis and rice were revealed. The expression levels of SmAGO genes in various tissues of S. miltiorrhiza were investigated. The results implied that some SmAGOs, such as SmAGO1, SmAGO2, SmAGO3, SmAGO7 and SmAGO10, probably played similar roles as their counterparts in Arabidopsis; whereas the others could be more species-specialized. It suggests the conservation and diversity of AGOs in plants. Additionally, we identified a total of 24 hairpin structures, representing six miRNA gene families, to be miRNA precursors. Using the modified 5′-RACE method, we confirmed that SmAGO1 and SmAGO2 were targeted by S. miltiorrhiza miR168a/b and miR403, respectively. It suggests the conservation of AGO1-miR168 and AGO2-miR403 regulatory modules in S. miltiorrhiza and Arabidopsis. This is the first attempt to explore SmAGOs and miRNAs in S. miltiorrhiza. The results provide useful information for further elucidation of gene silencing pathways in S. miltiorrhiza. Small RNAs (sRNAs) involved in various gene silencing pathways play important and diverse roles in the development and differentiation of organisms through regulating gene expression at the transcriptional and post-transcriptional levels , affecting heterochromatin formation , and responding to biotic and abiotic stresses . In plants, sRNAs are generated from double-stranded RNAs (dsRNAs) through various pathways and may be classified into two major classes, including microRNAs (miRNAs) and small interfering RNAs (siRNAs), based on the source of dsRNA . miRNAs are produced from plant transcripts with internal stem-loop structures, whereas siRNAs are derived from transcripts with inverted-repeat sequence, dsRNAs copied from single-stranded RNA (ssRNA), over-lapping regions of bidirectional transcripts, or dsRNAs formed by virus replication. The biogenesis pathways of plant sRNAs involve in various gene families, such as the Dicer-like (DCL) family and the RNA dependent RNA polymerase (RDR) family, and each pathway appears to be taken part in by different member of a gene family . To regulate gene expression, the generated sRNA duplexes from dsRNAs are loaded into RNA-induced silencing complexes (RISCs) with Argonautes (AGOs) as the central components . RISCs remove the star strand (known as miRNA* or siRNA*) of sRNA duplex and select the functional strand as a guide to interact with homologous RNA or DNA molecules for direct RNA cleavage, translational repression or DNA methylation [6, 7]. AGOs are ribonucleases with two conserved domains, including PAZ and PIWI . The PAZ domain contains a specific binding pocket that can anchor sRNA duplexes with two-nucleotide 3′ overhang. The PIWI domain exhibits endonuclease activity and the structure of PIWI domain folded is similar to RNase H . The endonuclease activity of PIWI domain is performed by an active site usually carrying an Asp–Asp–His (DDH) or Asp–Asp–Asp (DDD) motif. AGOs are usually encoded by a multiple gene family in organisms and the number of AGO genes differs in different organisms . Fission yeast has only one AGO gene, whereas insects, mammals and worms have five, eight, and twenty six AGO genes, respectively. Annotation of the Arabidopsis and rice genomes revealed ten and eighteen AGO genes, respectively . Additionally, a total of eighteen maize and fifteen tomato AGO genes have been identified [12, 13]. Although a large number of AGO genes have been found in various plants, the majority were predicted by computational approaches based on sequence similarity. Only a small proportion of known AGOs were identified or confirmed by full-length cDNA cloning. Among them, Arabidopsis AGO1 is the most well-studied plant AGO gene. It encodes the core component of RISCs associated with the action of miRNAs, trans-acting siRNAs (ta-siRNAs) and transgene-derived siRNAs . AGO2 protein is involved in antiviral defense by catalyzing viral RNA cleavage in Arabidopsis plants . Arabidopsis AGO4, AGO6 and AGO9 genes recruit endogenous 24nt sRNAs for DNA methylation, which causes target gene silencing at the transcriptional level [16, 17]. AGO7 is involved in the generation of ta-siRNAs from TAS3 by collaborating with miR390 in Arabidopsis. Arabidopsis AGO10 gene modulates shoot apical meristem maintenance and establishment of leaf polarity by repressing miR165/166 [19, 20]. In addition, although AGO proteins are central components of RISCs involved in sRNA-mediated RNA cleavage, translational repression and DNA methylation, some of them are regulated by sRNAs through the feedback mechanism. For instance, the expression level of AtAGO1 is regulated by miR168 through direct cleavage of AtAGO1 transcripts . Similarly, AtAGO2 is regulated by miR403 . The function and regulatory mechanism of AGO genes from plant species other than Arabidopsis is largely unknown. S. miltiorrhiza, which produces two major groups of bioactive compounds, lipophilic diterpenoid tanshinones and hydrophilic phenolic acids, is a well-known traditional Chinese medicine (TCM) widely used for treating various human diseases, such as dysmenorrhoea, amenorrhoea and cardiovascular disease, for thousands of years [23, 24]. It is also an emerging model plant for TCM studies because of its relatively small genome size, short life cycle, undemanding growth requirements, and significant medicinal value [25, 26]. The S. miltiorrhiza genome has been preliminarily decoded and a working draft of the genome is currently available (Chen et al., unpublished data). The interest of gene silencing pathways in S. miltiorrhiza is increasing. With the aim to elucidate the core components of gene silencing pathways, we performed a genome-wide prediction of the S. miltiorrhiza AGO gene family. Molecular cloning of AGO genes was carried out for validation and error correction of computational prediction. The characteristics of S. miltiorrhiza AGOs were revealed by a comprehensive analysis, including comparison with AGOs from other plant species, gene expression profiling, and analysis of posttranscriptional regulation. The results provide useful information for further elucidation of gene silencing pathways in S. miltiorrhiza. To predict S. miltiorrhiza AGO genes at the genome level, we downloaded all of 10 Arabidopsis and 19 rice AGO amino acid sequences from GenBank (http://www.ncbi.nlm.nih.gov/protein). BLAST analysis of Arabidopsis and rice AGOs against the current assembly of the S. miltiorrhiza genome (Chen et al., unpublished) was then performed using the tBLASTn algorithm . An e-value cut-off of 10-10 was applied to the homologue recognition. As a result, a total of 10 genomic loci of SmAGO genes were identified. The genomic DNA sequence was retrieved and gene models of 10 SmAGO genes were predicted using Genscan (http://genes.mit.edu/GENSCAN.html) . The models were further examined and corrected manually by comparison with AGO genes identified from other plant species using the BLASTx algorithm (http://www.ncbi.nlm.nih.gov/BLAST) . All of 10 deduced proteins share high sequence similarity with known plant AGOs and contain the conserved PAZ and PIWI domains, suggesting they are authentic AGOs. 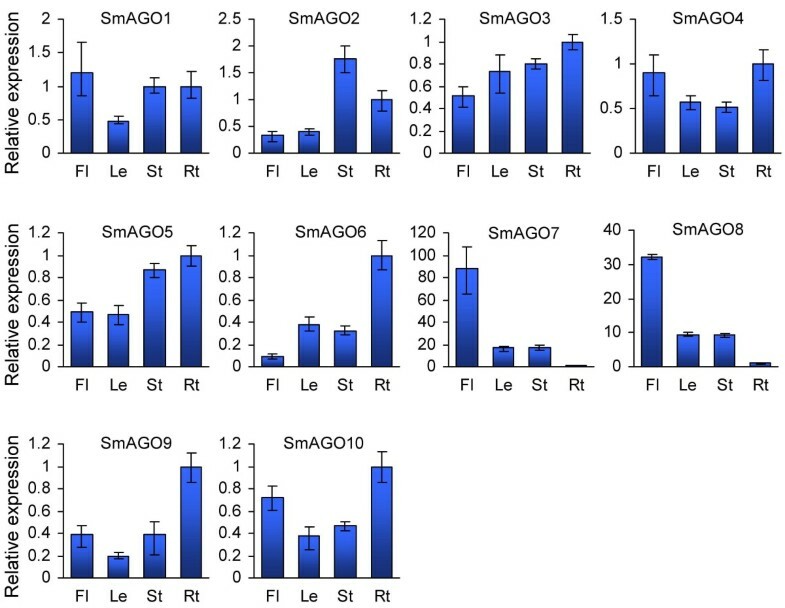 The identified AGO genes are named SmAGO1 to SmAGO10, respectively, based on high sequence similarity with corresponding Arabidopsis AGOs. It is very important to know the correct cDNA sequence for systematic characterization of AGOs in S. miltiorrhiza. In order to confirm the results from prediction and correct errors of computation, molecular cloning of full-length SmAGO cDNA was carried out. As a result, all of ten predicted SmAGO genes were experimentally validated. Analysis of sequence features showed that the length of open reading frames (ORFs) of SmAGOs varied from 2,472 (SmAGO5) to 3,195 bp (SmAGO1) (Table 1). The length of 5′ and 3′ UTRs was between 30 and 202 bp and between 91 and 337 bp, respectively. The size of deduced SmAGO proteins varied between 823 and 1064 amino acids, the molecular weight (Mw) varied from 93.2 to 118.7 kDa, and the theoretical pI was between 9 and 10 (Table 1). These sequence features are quite similar to that of AtAGOs in Arabidopsis (Table 2). The similarity between SmAGOs and AtAGOs was also observed in gene structures. Many SmAGOs genes have the number and phase of introns similar to an AtAGO, such as SmAGO1/AtAGO1, SmAGO4/AtAGO4, SmAGO7/AtAGO7, SmAGO8/AtAGO8, and SmAGO9/AtAGO9 (Tables 1 and 2, Figures 1 and 2). Additionally, both SmAGO6/AtAGO6 and SmAGO9/AtAGO9 have an intron in 3′ UTR (Figures 1 and 2). The results suggest the conservation between SmAGOs and AtAGOs. Gene structures of AGOs in S. miltiorrhiza . Exons, UTRs, introns and intron phases are shown. Gene structures of AGOs in Arabidopsis . Exons, UTRs, introns and intron phases are shown. Search S. miltiorrhiza AGO proteins for conserved domains against the NCBI Conserved Domain Database (CCD) revealed that all SmAGOs contained DUF1785, PAZ, and PIWI domains (see Additional file 1), which were consistent with the results from other plant AGOs . The function of DUF1785 is currently unknown; whereas PAZ has been shown to play roles in binding sRNA duplexes and PIWI are important in cleavage of target RNA [30, 31]. The endonuclease activity of PIWI domain is performed by an active site usually carrying a DDH or DDD motif [15, 32]. Additionally, a conserved histidine at position 798 of Arabidopsis AGO1 was found to be critical for in vitro endonuclease activity . Analysis of ten S. miltiorrhiza AGOs showed that half of them, namely SmAGO1, SmAGO2, SmAGO3, SmAGO7 and SmAGO10, contained the conserved DDH/H798 or DDD/H798 residues; whereas the conserved residues were not observed in the other SmAGOs (see Additional file 2). In SmAGO4, SmAGO5 and SmAGO8, the third histidine was missing or replaced by leucine. SmAGO6 and SmAGO9 possessed the conserved DDH triad but histidine at 798th position was either replaced by alanine or proline (see Additional file 2). Phylogenetic analysis using the PAZ and PIWI domains for rice, Arabidopsis, Caenorhabditis elegans, Drosophila melanogaster, and mouse had previously revealed that animal AGOs clustered into two subgroups: A1 and A2, whereas all plant AGOs could be divided into four subgroups: AGO1, ZIPPY, AGO4, and MEL1 . The AGO1 and MEL1 subgroups had a common lineage with A1, whereas plant ZIPPY and AGO4 subgroups and animal A2 subgroup could be diverged from an ancestral lineage . In order to determine the evolutionary relationship of S. miltiorrhiza AGOs, full-length AGO protein sequences from S. miltiorrhiza, Arabidopsis and rice were aligned and an unrooted neighbor-joining tree was constructed. The results showed that ten SmAGOs could also be divided into four subgroups (Figure 3). Moreover, the clustering remained similar when only the PAZ and PIWI protein domains were used for phylogenetic analysis (data not shown). SmAGO1 and SmAGO10 are included in the AGO1 subgroup with Arabidopsis AtAGO1 and AtAGO10, and rice OsAGO1a-OsAGO1d and OsPNH1. SmAGO1 shares high similarity with AtAGO1 associated with the action of miRNAs, ta-siRNAs and transgene-derived siRNAs , whereas SmAGO10 is highly similar to AtAGO10 modulating shoot apical meristem maintenance and establishment of leaf polarity . SmAGO2, SmAGO3 and SmAGO7 are members of the subgroup ZIPPY. Similarly, three Arabidopsis AGOs, including antiviral defense-associated AtAGO2, function-unknown AtAGO3 and AtAGO7 involved in the generation of ta-siRNAs from TAS3, are also included in this subgroup. SmAGO7 shares greater similarity with AtAGO7. SmAGO2 and SmAGO3 are highly similar to AtAGO2 and AtAGO3. The MEL1 subgroup contains only one S. miltiorrhiza AGO, SmAGO5, which is similar to the function-unknown Arabidopsis AtAGO5. On the contrary, the AGO4 subgroup is the biggest among four plant AGO subgroups. It contains five S. miltiorrhiza AGOs, including SmAGO4, SmAGO6, SmAGO8 and SmAGO9. Unrooted neighbor-joining phylogenetic tree of AGOs from S. miltiorrhiza , Arabidopsis and rice. The deduced full-length amino acid sequences were aligned using ClustalW version 1.83 and the phylogenetic tree was constructed using MEGA 4.0 by the neighbor-joining (NJ) method with 1000 bootstrap replicates. Four subgroups, including AGO1, MEL1, AGO4 and ZIPPY, are indicated. SmAGOs are shown in bold. The expression of SmAGO genes in flowers, leaves, stems and roots of 2-year-old, field nursery-grown S. miltiorrhiza was analyzed using quantitative RT-PCR technology. SmUBQ10 was chosen as an endogenous control as previously described . All of ten SmAGOs were expressed in S. miltiorrhiza tissues analyzed, whereas differential expression patterns were observed (Figure 4). 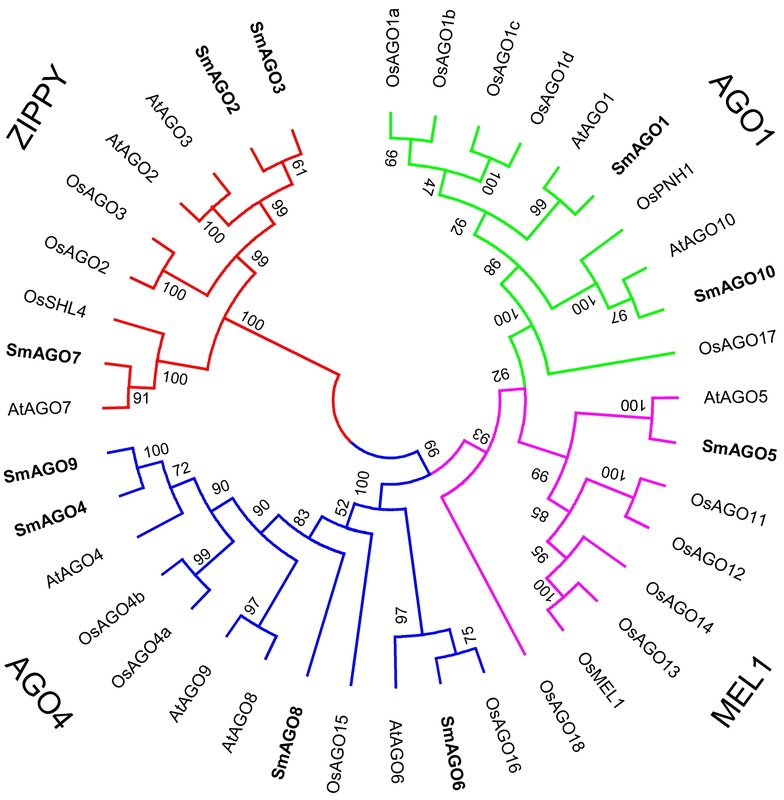 SmAGO1 and SmAGO10 clustered in the AGO1 subgroup were expressed in flowers, leaves, stems and roots as their Arabidopsis counterparts, AtAGO1 and AtAGO10, respectively . It is consistent with the ubiquitous roles of AGOs in the AGO1 subgroup. Although SmAGO2, SmAGO3 and SmAGO7 were clustered in the ZIPPY subgroup, their expression patterns were distinct (Figure 4). On the other hand, the expression patterns of SmAGO2, SmAGO3 and SmAGO7 were quite similar to their Arabidopsis counterparts, AtAGO3, AtAGO2, and AtAGO7, respectively . By contrast, the expression pattern of SmAGO5 was distinct with their Arabidopsis and rice counterparts in the MEL1 subgroup. SmAGO5 showed the highest expression in roots, followed by stems, less in flowers and leaves. It is distinct with its counterparts, AtAGO5 in Arabidopsis and OsMEL1, OsAGO12, OsAGO13 and OsAGO14 in rice, showing specifically expression in reproductive tissues (Figure 4) . Similar to the SmAGOs in the ZIPPY subgroup, SmAGO4, SmAGO6, SmAGO8 and SmAGO9 clustered in the AGO4 subgroup exhibited divergent expression patterns (Figure 4). SmAGO8 was more flower-specific, an expression pattern similar with SmAGO7 in the ZIPPY subgroup; whereas, SmAGO6 and SmAGO9 were more root-specific. The results indicate the functional conservation and diversity of AGOs. Expression of SmAGOs in flowers (Fl), leaves (Le), stems (St) and roots (Rt) of S. miltiorrhiza . Fold changes of SmAGO expression are shown. Expression levels were quantified by qRT-PCR. SmUBQ10 was used as a reference gene. The levels in roots were arbitrarily set to 1. Error bars represent the standard deviations of three technical PCR replicates. To determine whether S. miltiorrhiza AGOs are regulated by miRNAs, we performed a target search of plant miRNAs in miRBase against ten full-length SmAGO cDNA sequences using psRNATarget [35, 36]. The maximum expectation of 3.5 was applied in the target search. A total of 31 miRNA families were found to have perfect or near-perfect complementarity to SmAGOs. It includes 28 mature miRNAs and 3 likely miRNA* (aly-miR167d-3p, ptc-miR169n-3p, and gma-miR396j). Plant miRNA sequences belonging to the 31 families were aligned with the current assembly of the S. miltiorrhiza genome using SOAP2 with two mismatches allowed . Genomic DNA fragments surrounding these miRNA sequences were used to predict the secondary structure using the mfold program . 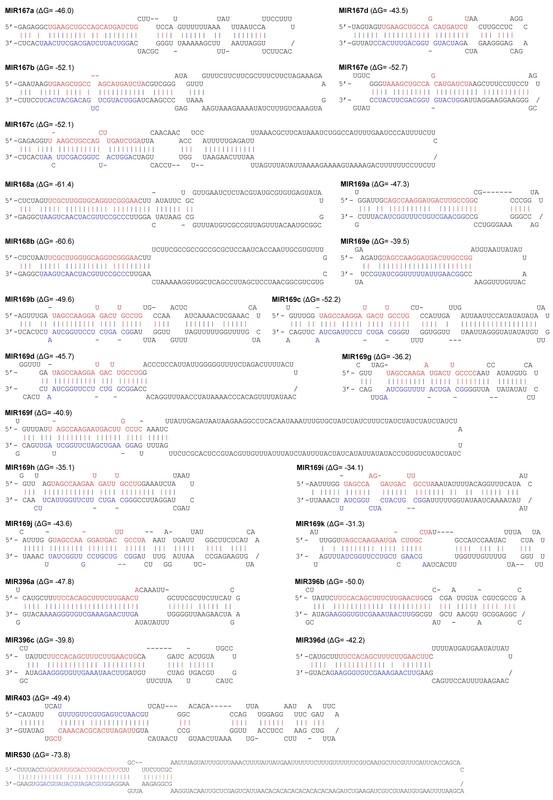 A total of 24 hairpin structures were identified for six miRNA families, including miR167, miR168, miR169, miR396, miR403 and miR530 (Figure 5). Manual examination of the complementarities between SmAGOs and the identified S. miltiorrhiza miRNAs/miRNAs* and calculation of penalty scores as previously described  showed that the scores for S. miltiorrhiza miR168:SmAGO1, miR403:SmAGO2 and miR530:SmAGO1 were 2, 0, and 3.5, respectively. However, the scores for miR167*:SmAGO8, miR169*:SmAGO5, miR396*:SmAGO3 and were at least 5.5, 9.5, and 5.0, respectively. High penalty scores for S. miltiorrhiza miRNA*:SmAGOs were due to low conservation among plant miRNAs*. To verify whether these miRNAs can mediate the cleavage of SmAGO transcripts, we isolated RNAs from roots and pooled samples containing flowers, leaves, stem and roots of S. miltiorrhiza and performed the modified 5′-rapid amplification of cDNA ends (RACE) for SmAGOs. The 5′-RACE products revealed that SmAGO1 and SmAGO2 are indeed the targets of S. miltiorrhiza miR168 and miR403, respectively (Figure 6). miR168 targets to the DUF1785 domain (from 477 to 497 bp) region of SmAGO1, while the target site of miR403 is within the 3′UTR of SmAGO2. It is consistent with the results from Arabidopsis[21, 22], suggesting the conservation of miR168- and miR403-mediated regulation of AGOs between S. miltiorrhiza and Arabidopsis. We also cloned 5′-RACE products with the 5′-end mapped to the miR169* complementary region of SmAGO5; however, the positions are not between the 10 and 11 nucleotides from the 5′-end of the miRNA (data not shown). No 5′-RACE products were obtained for SmAGO8, SmAGO3 and SmAGO1 that were predicted to be targeted by miR167, miR396, and miR530, respectively. In addition, miRNA-specific qRT-PCR  was performed to examine the expression patterns of S. miltiorrhiza miR168 and miR403 experimentally validated to target SmAGO1 and SmAGO2 for cleavage. The results showed that miR168 and miR403 were expressed in all tissues analyzed. The levels of miR168 in roots and flowers were about three times the levels in leaves and stems. The level of miR403 in flowers was more than twice the level in other tissues analyzed (Figure 7). Predicted hairpin structures of S. miltiorrhiza miRNA precursors. Mature miRNA sequences are indicated in red. miRNA* are indicated in blue. The red, green and blue vertical lines indicate G:C, G:U and A:U pairing, respectively. Experimental validation of miR168a/b- and miR403-mediated cleavage of SmAGO1 and SmAGO2 , respectively. Cleavage sites were determined by the modified 5′ RNA ligase-mediated RACE. Heavy black lines represent ORFs. The lines flanking gray regions represent nontranslated regions. miRNA complementary sites with the nucleotide positions of SmAGO1 and SmAGO2 cDNAs are indicated. The RNA sequence of each complementary site from 5′ to 3′ and the predicted miRNA sequence from 3′ to 5′ are shown in the expanded regions. Watson-Crick pairing is indicated by vertical dashes. Vertical arrows indicate the 5′ termini of miRNA-guided cleavage products, as identified by 5′-RACE, with the frequency of clones shown. Expression of miR168a/b and miR403 in flowers (Fl), leaves (Le), stems (St) and roots (Rt) of S. miltiorrhiza . 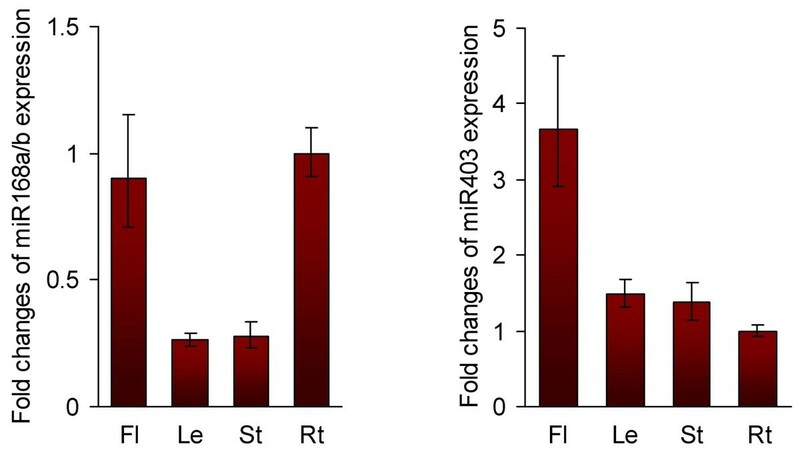 Fold changes of miRNA expression are shown. Expression levels were quantified by miRNA-specific qRT-PCR. S. miltiorrhiza 5.8S rRNA was used as a reference gene. The levels in roots were arbitrarily set to 1. Error bars represent the standard deviations of three technical PCR replicates. Although Argonautes play very important roles in small RNA-mediated gene silencing and a large number of AGO genes have been found in plants, many of them were identified through computational prediction based on sequence similarity. For example, often Arabidopsis AtAGOs, seven, including AtAGO1, AtAGO2, AtAGO4, AtAGO6, AtAGO7, AtAGO9 and AtAGO10, have been experimentally tested, whereas the other three, including AgAGO3, AtAGO5 and AtAGO8, were predicted computationally (http://www.arabidopsis.org/). Among nineteen rice OsAGO genes, only six, including OsAGO1a, OsAGO1b, OsAGO1c, OsAGO1d, OsAGO7 and OsPNH1, have been cloned (http://www.ricedata.cn/gene). Except for SlAGO1-1, SlAGO1-2 and SlAGO7, twelve of fifteen tomato SlAGO genes have not been experimentally confirmed [41, 42]. In this study, we performed a genome-wide prediction of ten SmAGOs using computational approaches, and then cloned the full-length cDNAs of all predicted SmAGOs. The number of identified S. miltiorrhiza AGO genes is comparable with that in Arabidopsis, although it is significantly less than the number in rice and maize, which are nineteen and eighteen, respectively [11, 12]. It indicates that less duplication events are occurred for AGO genes in S. miltiorrhiza and Arabidopsis as compared with rice and maize AGOs, most of which are evolved by duplication events [11, 12]. The results provide very useful information for further elucidation of AGO functions in S. miltiorrhiza and gene model prediction of AGOs in other plant species. Plant AGO proteins share three highly conserved domains, including DUF1785, PAZ, and PIWI . Consistently, all SmAGOs were found to contain these domains (see Additional file 1). PAZ functions in binding sRNA duplexes and PIWI is involved in RNA cleavage, whereas the function of DUF1785 remains to be elucidated [30, 31]. The conserved DDH/H798 or DDD/H798 residues in PIWI domain have been demonstrated to be critical for the endonuclease activity of AGO proteins [15, 32]. The conserved residues were also found in five of ten SmAGOs (see Additional file 2). It includes SmAGO1 and SmAGO10 belonging to the AGO1 subgroup and SmAGO2, SmAGO3 and SmAGO7 included in the ZIPPY subgroup. Consistently, expression profiling of these SmAGOs revealed similar patterns with their Arabidopsis counterparts (Figure 4) . It indicates S. miltiorrhiza AGOs in the AGO1 and ZIPPY subgroup may play similar functions in the action of miRNAs, ta-siRNAs and transgene-derived siRNAs and in antiviral defense as their counterparts in Arabidopsis. On the other hand, in the other five SmAGOs, one or two of the conserved residues was missing or replaced by other residues. It includes SmAGO5 belonging to the MEL1 subgroup, and SmAGO4, SmAGO6, SmAGO8 and SmAGO9 included in the AGO4 subgroup. Comparison of AGOs revealed that many Arabidopsis and rice AGOs belonging to the MEL1 and AGO4 subgroups were also lack of the conserved DDH/H798 or DDD/H798 motif, such as Arabidopsis AtAGO4, AtAGO6, AtAGO8 and AtAGO9, rice OsAGO4a, OsAGO4b, OsAGO15 and OsAGO16 included in the AGO4 subgroup, and rice OsAGO11, OsAGO13, OsAGO14 and OsAGO18 belonging to the MEL1 subgroup [11, 13]. The function of AGOs in the MEL1 subgroup is currently unknown, whereas three of four Arabidopsis AGOs included in the AGO4 subgroups have been shown to recruit endogenous 24nt sRNAs for DNA methylation [44–46]. It indicates that some of SmAGOs in the MEL1 and AGO4 subgroups probably play a role in DNA methylation instead of RNA cleavage in S. miltiorrhiza. Since the expression patterns of SmAGOs in the MEL1 and AGO4 subgroups are distinct with their Arabidopsis counterparts (Figure 4) , some SmAGOs in these subgroups may play more species-specialized roles. Further elucidation of these species-specialized roles will definitely add new insights into AGO-associated gene silencing. In addition, absence of the conserved DDH/H798 or DDD/H798 motif was also found in some AGO proteins from other plant species, such as maize and tomato [12, 13]. It is possible that some of the AGO proteins without the deeply conserved DDH/H798 or DDD/H798 motif are still capable of target RNA cleavage. In this case, the unconserved residues in the motif may contribute to endonuclease activity. Otherwise, they may be not a cleavage component if the deletion or replacement of conserved residues in the motif results in loss of endonuclease activity. Further experimental analysis is necessary to clarify the hypothesis. miRNAs are a class of small endogenous non-coding RNAs with size about 21 nucleotides. They are derived from primary miRNAs (pri-miRNAs) transcribed from miRNA loci . Pri-miRNAs have internal stem-loop structures that are cleaved by DCL1 to form miRNA precursors, known as pre-miRNAs. miRNAs play vital roles in plant development and stress responses and have been identified from various plant species [39, 48, 49]; however, there is no report for miRNAs in S. miltiorrhiza, an emerging model medicinal plant. Through a computational approach, we predicted 24 miRNA genes in S. miltiorrhiza for the first time. They represent 6 miRNA gene families, including miR167, miR168, miR169, miR396, miR403 and miR530 (Figure 5). Using the modified 5′-RACE method, we confirmed that SmAGO1 and SmAGO2 were targeted by S. miltiorrhiza miR168a/b and miR403, respectively (Figure 6). Consistently, in Arabidopsis, AtAGO1 and AtAGO2 were also regulated by miR168 and miR403, respectively [21, 22]. It suggests the existence of conserved regulatory mechanism for some AGOs in S. miltiorrhiza and Arabidopsis. It is generally considered that miRNA expression is negatively correlated with that of targeted mRNAs . However, there are many exceptions. For instance, miR160, miR164 and miR172 showed a positive correlation with their targets in rice . Comparing the expression of S. miltiorrhiza miRNAs and their targets showed that no simple linear correlations existed between miR168 and SmAGO1 and between miR403 and SmAGO2 (Figures 4 and 7). It could be a consequence of the feedback regulation of miR168/AGO1 and miR403/AGO2 [21, 22]. It is also possible that these miRNAs and targets are regulated by other unidentified factors associated with a more complex regulation [52, 53]. Although we cloned cDNA fragments with the 5′-end mapped to the miR169* complementary region of SmAGO5, they were probably not the products of miR169*-directed cleavage. First, the penalty scores for miR169*:SmAGO5 were at least 9.5, suggesting low complementarity between miR169* and SmAGO5. Second, the positions mapped were not located between the 10 and 11 nucleotides from the 5′-end of miR169*, which was atypical for miRNA-directed cleavage . S. miltiorrhiza miR167*, miR396* and miR530 were computationally predicted to target SmAGO8, SmAGO3 and SmAGO1 for cleavage, but no 5-RACE products were obtained for these SmAGOs. It indicates that these miRNAs are probably not involved in the regulation of SmAGOs. However, we can not rule out the possibility that some of the miRNAs regulate SmAGO mRNA levels in tissues unanalyzed or at specific developmental stages of S. miltiorrhiza or in cells undergoing certain environmental stresses. It is also possible that some of the miRNAs interact with SmAGO mRNAs for translational repression. Further analyzing the interaction between miRNAs and SmAGOs through genetic transformation may give us a clearer picture about the regulatory mechanism of SmAGOs. The decoding of S. miltiorrhiza genome allowed us to perform a genome-wide prediction of SmAGO genes. The prediction was further confirmed by full-length cDNA cloning, which resulted in identification of the first set of full-length AGO cDNAs in a plant species. Through a comprehensive approach, combining sequence feature, gene structure and conserved domain comparison of SmAGOs and AtAGOs; phylogenetic analysis of AGO proteins in S. miltiorrhiza, Arabidopsis and rice; and expression of SmAGO genes S. miltiorrhiza, we characterized the newly identified 10 SmAGOs. The results suggest the conservation and diversity of sequence features and gene functions among AGOs from different plant species. Analysis of posttranscriptional regulation of AGO genes suggested the existence of conserved AGO1-miR168 and AGO2-miR403 regulatory modules in S. miltiorrhiza and Arabidopsis. These results will help to open a window for understanding gene silencing networks in the well-known TCM plant, S. miltiorrhiza. S. miltiorrhiza Bunge (line 993) with whole genome sequences available was grown in a field nursery. Mature flower buds blooming soon, mature and healthy leaves, young stems and roots in about 0.5 cm diameter were collected from 2-year-old plants on Aug. 15, 2012. Samples from three plants were pooled and stored in liquid nitrogen until use. Arabidopsis and rice AGO protein sequences were downloaded from GenBank (http://www.ncbi.nlm.nih.gov/protein) and used to search for homologues against the current assembly of the S. miltiorrhiza genome (Chen et al., unpublished) using the tBLASTn algorithm . An e-value cut-off of 10-10 was applied to the homologue recognition. All retrieved sequences were used for gene prediction on the Genscan web server (http://genes.mit.edu/GENSCAN.html) . The predicted gene models were further examined and corrected manually by comparison with AGO genes identified from other plant species using the BLASTx algorithm (http://www.ncbi.nlm.nih.gov/BLAST) . Total RNA was extracted from the root of S. miltiorrhiza using Trizol reagent (invitrogen). mRNA was purified using the oligotex mRNA mini kit (invitrogen). RNA ligase-mediated rapid amplification of 5′ cDNA ends (5′-RACE) and 3′ cDNA ends (3′-RACE) was performed on mRNA using the GeneRacer kit (Invitrogen). PCR amplifications were performed using the GeneRacer primer and the nesting gene-specific primers (see Additional files 3 and 4) under the following conditions: predenaturation at 94°C for 2 min, 5 cycles of amplification at 94°C for 30 s and 72°C for 1 min, 5 cycles of amplification at 94°C for 30 s and 70°C for 1 min, 25 cycles of amplification at 94°C for 30 s, 56°C for 30 s and 72°C for 2 min, followed by a final extension at 72°C for 15 min. Nested PCR amplifications were carried out using the GeneRacer nested primer and the nested gene-specific primers (see Additional files 3 and 4) under the following conditions: predenaturation at 94°C for 2 min, 30 cycles of amplification at 94°C for 30 s, 58°C for 30 s and 72°C for 2 min, followed by a final extension at 72°C for 15 min. PCR products were purified, cloned and sequenced. Based on the obtained 5′ and 3′ cDNA sequence, gene-specific forward and reverse primers (see Additional file 5) were designed for amplification of full-length SmAGO cDNA. PCR amplifications were performed under the following conditions: predenaturation at 94°C for 2 min, 30 cycles of amplification at 94°C for 30 s, 56°C for 30 s and 72°C for 3 min, followed by a final extension at 72°C for 15 min. PCR products were gel-purified, cloned and sequenced. The molecular weight (MW) and theoretical isoelectric point (pI) were predicted using the Compute pI/MW tool on the ExPASy server (http://web.expasy.org/compute_pi/). Intron/exon structures were analyzed manually based on genomic DNA sequences and the cloned cDNA sequences. Conserved domains were analyzed by search the deduced amino acid sequence of SmAGOs against the NCBI conserved domain (http://www.ncbi.nlm.nih.gov/Structure/cdd/wrpsb.cgi). The conserved residues were analyzed by alignment of amino acid sequences using DNAMAN and then checked manually. For phylogenetic tree construction, amino acid sequences of AGOs from S. miltiorrhiza, Arabidopsis and rice were first aligned using ClustalW version 1.83 and then constructed using MEGA version 4.0 by the neighbor-joining method with bootstrap to be 1000 replicates [55, 56]. Total RNA was extracted from plant tissues using the plant total RNA extraction kit (BioTeke) and then treated with RNase-free DNase (Promega) to remove genomic DNA contamination. RNA integrity was analyzed on a 1% agarose gel. RNA quantity was determined using a NanoDrop 2000C Spectrophotometer (Thermo Scientific). Reverse transcription was performed on 1 μg total RNA by 200 U Superscript III reverse transcriptase (Invitrogen) in a 20 μl volume. The resulting cDNA was diluted to 200 μl with sterile water. qPCR was carried out in triplicates using the BIO-RAD CFX system (Bio-Rad). Gene-specific primers were listed in Additional file 6. SmUBQ10 was used as a reference as previously described . PCR was carried out in a 20 μl volume containing 2 μl diluted cDNA, 250 nM forward primer, 250 nM reverse primer, and 1 × SYBR Premix Ex Taq II (TaKaRa) using the following conditions: predenaturation at 95°C for 30 s, 40 cycles of amplification at 95°C for 5 s, 60°C for 18 s and 72°C for 15 s. The results from gene-specific amplification were analyzed using the comparative Cq method which uses an arithmetic formula, 2-ΔΔCq, to achieve results for relative quantification . Cq represents the threshold cycle. The levels of miR168a/b and miR403 were analyzed using the miRNA-specific poly(T) adaptor RT-PCR method . Briefly, 1 μg DNaseI-treated total RNA was polyadenylated using the Poly(A) Tailing kit (Ambion) as described previously  and then reverse-transcribed into single-strand cDNA. qRT-PCRs were performed in triplicates as described . S. miltiorrhiza 5.8S rRNA was used as an endogenous reference. Primers used for miRNA quantification were listed in Additional file 7. Known plant miRNA sequences were downloaded from miRBase (release 19, http://www.mirbase.org/) . Target search of known plant miRNAs was performed against ten full-length SmAGO cDNA sequences using psRNATarget . The maximum expectations of 3.5 and the target accessibility-allowed maximum energy to unpair the target site of 50 were applied. The identified plant miRNA sequences were then aligned with the current assembly of the S. miltiorrhiza genome (Chen et al., unpublished) using the SOAP2 program with no more than 2 mismatches allowed . Hairpin structures were predicted using the mfold program . Criteria described by  were applied to annotate S. miltiorrhiza miRNAs. SmAGO cleavage sites were mapped using the modified RNA ligase-mediated rapid amplification of 5′ cDNAs method as described . PCRs were carried out on mRNA isolated from S. miltiorrhiza roots and pooled samples containing flowers, leaves, stem and roots using the GeneRacer 5′ primer and the nesting gene-specific primers (see Additional file 8). Nested PCRs were performed using the GeneRacer 5′ nested primer and the nested gene-specific primers (see Additional file 8). We thank Dr. Shilin Chen and the sequencing group in our institute for kindly providing the S. miltiorrhiza genome sequence. This work was supported by grants from the Beijing Natural Science Foundation (grant no. 5112026 to SL), the Major Scientific and Technological Special Project for Significant New Drugs Creation (grant no. 2012ZX09301002-001-031 to SL), the Research Fund for the Doctoral Program of Higher Education of China (20111106110033 to SL), the Program for Changjiang Scholars and Innovative Research Team in University (PCSIRT, grant no. IRT1150), and the Program for Xiehe Scholars in Chinese Academy of Medical Sciences & Peking Union Medical College (to SL). FS analyzed the data, performed qRT-PCR and RACE, and participated in writing the manuscript. SL designed the experiment and wrote the manuscript. Both authors have read and approved the version of manuscript.